SILICON Valley is driving in to try to strip traditional carmakers of their clout. Apple is the latest technology powerhouse to dabble in vehicles — it has hired several hundred engineers and other automotive experts and has held talks with car parts supplier Magna. From Tesla Motors to Google to Uber and beyond, though, the shift to putting large numbers of connected, self-driving vehicles on the roads may take a while. But it could shake up everything in the industry, from systems to materials to car usage. The winners may be able to rev up returns but traditional carmakers risk being on the losing side. The industry is still dominated by the chassis, the power train and other traditional hardware. That is changing in two ways. First, technology systems are fast becoming at least as important to car buyers as the shell and the engine. As intelligent cameras, sensors and other advanced driver assistance systems (ADAS) proliferate, they’ll become more important, and open up avenues into the business that current manufacturers might not always be best placed to navigate. Second, software is taking on a far more important role. Currently it accounts for just 10% of the value of what goes into a car, compared to hardware at 90%. As autonomous driving takes the wheel, these trappings could cover 40% of a vehicle’s make-up, with content accounting for the rest. Software and some of the new hardware add up to the initial sweet spot for Silicon Valley. What vehicles need to be able to drive themselves is all manner of algorithms and other tools that can coordinate the systems within a car as well as communicate with other vehicles on the road, traffic signals and the like. Think everything from cameras to voice recognition software to artificial neural networks that can learn, remember and make decisions. Automakers can certainly compete here. with basic ADAS capabilities already in many cars. Even now, though, 70% of the value added to cars comes from parts makers. The danger for old-school auto firms is that the complexity of the systems required plays into the hands of deep-pocketed, code-savvy technology companies. 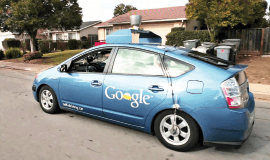 Regulation is one of the major sticking points to wider adoption of self-driving cars. Officials need to be persuaded new and unfamiliar systems are safe. That could take five years or more. Writing and implementing rules could take another five years. Price is another factor. Only 20% of drivers would be willing to pay an extra US$4,000 (RM14,720) for ADAS features. The cost of new tech will come down. But it’s logical that buyers will spend more and more money on self-driving systems and software supplied by Silicon Valley at the expense of more traditional features from automakers. After all, greater efficiency is touted as one of the main advantages of self-driving cars. Improved safety is meant to be the other big plus from all the new car technology.